City Connection tonight will feature Commissioner Joe Jones and a discussion on the 2nd ward. 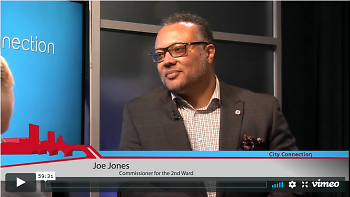 City Connection - May 2018 - 2nd Ward Commissioner Joe Jones from GRTV on Vimeo. Join us today, Monday, May 7 at 5 p.m. on LiveWire, Comcast Cable 24, for tonight's episode of the City Connection. Mayor Rosalynn Bliss will be interviewing Commissioner Joe Jones and discussing the second ward.